This week, I had some spare time so I was hanging out at Dynamic Autosports and watched as the guys wrenched on the Peak Performance 240SX S14 in preparation for D1GP at Irwindale on March 4th.. the car started up Tuesday night.. but it wasnt until Wednesday night until they started tuning.. unfortunately, I had to get up to go to work on Thursday, so I couldn’t stay for the show.. but I managed to snap a few pics before I left.. the guys from XS Engineering were there prepping their Nissan Skyline R32 GTR for Modified Magazine’s Time Attack at California Speedway on March 5th so I got a few of them “in action”.. 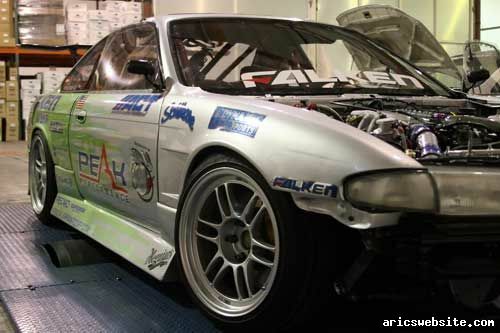 Dynamic Autosports took the Peak Performance Nissan 240SX S14 down to Irwindale today for some test laps and tech inspection.. Robbie Nishida of Falken will be driving the car this season, so it was his first time behind the wheel.. I heard he was pleasantly surprised with the car.. I heard he kept repeating, “this car is amazing.. this car is amazing..”.. 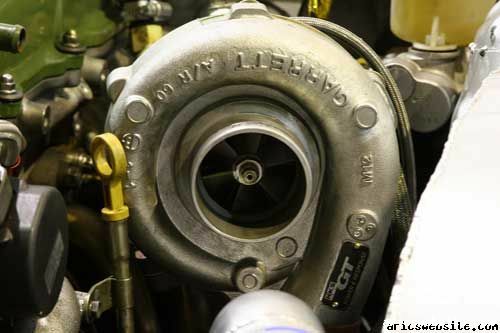 I guess he really liked the 2.4 liter SR20 with the HKS sequential trannie.. Here are a few pics.. unfortunately bandwidth doesnt grow on trees, so I resized the images and saved them at 30% quality.. most of the pics were shot at ISO1600 or 3200.. cleaned up with Noise Ninja 2, sharpened (USM) with Photoshop CS2..
A shot of the Peak Performance Nissan 240SX S14 (minus front bumper) waiting on the dyno to get its HKS VPro tuned..
Fei-Lo of XS Engineering putting the finishing touches on their roll cage.. 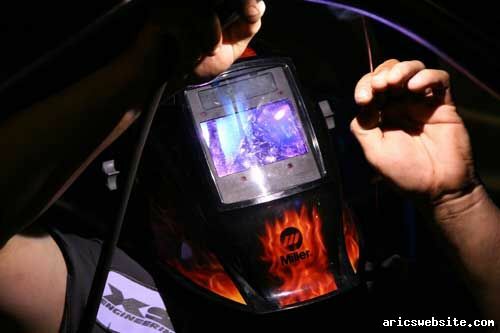 I heard Fei-Lo is a master welder now.. I guess thats why he can wear a mask like that..
A front shot of the XS Engineering Nissan Skyline GTR R32.. they were corner balancing the car in preparation for the Modified Magazine Time Attack.. you G4TV viewers may recognize the car from the Street Tuner Challenge TV show.. the car is insane in real life.. the Nissan Skyline GTR R32 has still got to be one of the most aggressive looking cars.. ever..